The last six weeks have been a breathless dash and blogging I’m afraid has consequently suffered. The Patchings Art Festival in early June was marvellous as usual and it was good to see some of you there. It is always so well organised and seems to get better every year thanks to Chas Wood and his enthusiastic team. More recently I’ve been reveling in the Italian Dolomites, a great favourite with such drama, colour and atmosphere for the landscape artist. Although there were lots of blue skies, thankfully the clouds made their presence felt most strongly at times, enabling me to get away from the picture postcard effect, though occasionally they did rather overdo it a bit and totally obscure just about everything except my feet, at high altitude. The illustration on the right shows one of my low-level watercolour sketches done on cartridge paper. Cloud is obscuring much of the peak and there are a number of ways of tackling this. Here I simply left the white areas as untouched paper, highlighting the white clouds by painting around them with a light grey, or as in some places a darker grey to suggest the darker mountain behind. I softened the edges of the clouds with a damp brush as I progressed, to suggest the light airiness of cloud, but sometimes a hard edge is left inadvertently. When this happens I let the paper dry then brush over the hard edge with just water on a small flat brush – a quarter-inch or 5mm one is fine. When this softens the edge I dab it with clean tissue and a soft edge has emerged. Other ways to achieve the effect of mountains, ridges and crags disappearing into cloud are described in my book Skies, Light & Atmosphere, published by Search Press. If you don’t have the book you can order a signed copy from my website and we will include a FREE dot card of Daniel Smith watercolours (David Bellamy palette) for a limited time only. I wish you many happy cloudy moments with your paintbrush. Including figures in a landscape painting is one of the most basic ways of suggesting a sense of scale, but in a vast landscape where do you position them, and how large should they be? These can be critical decisions for the artist, especially as figures tend to immediately attract the eye of the viewer. They therefore become the focal point. 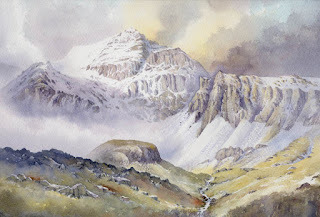 In this large watercolour of Gyrn Las in Snowdonia the two figures are barely discernible in such a small reproduction. They are actually standing at the top of the small stream descending to the right of centre in the lower part of the composition. Even in the original they are not obvious, but once you know they are there they impart a feeling of being completely dwarfed in an immense landscape. They could not have been painted much smaller without completely losing them, but had they been made much larger the scene would appear a great deal smaller. The optimum position for placing figures is about one-third into the painting from either side and one-third from the top or bottom of the composition, but this can be varied to a degree, to suit the scene. Here they are a little less than one-third in from the bottom, but about one-third from the right-hand side. Like boy scouts, we should always be well prepared as artists, for those moments when the weather and atmosphere create stunning effects that we simply cannot ignore. This means not just carrying sketchbook and camera around with us when we’re in the great outdoors, but being ready to venture out at short notice when a little seasonal magic appears. At this time of year I’m always aware that snow may well fall at any time on the hills and mountains, and if this coincides with those flaming autumn colours we have stunning possibilities for superb landscape paintings, so keep an eye on them there hills! 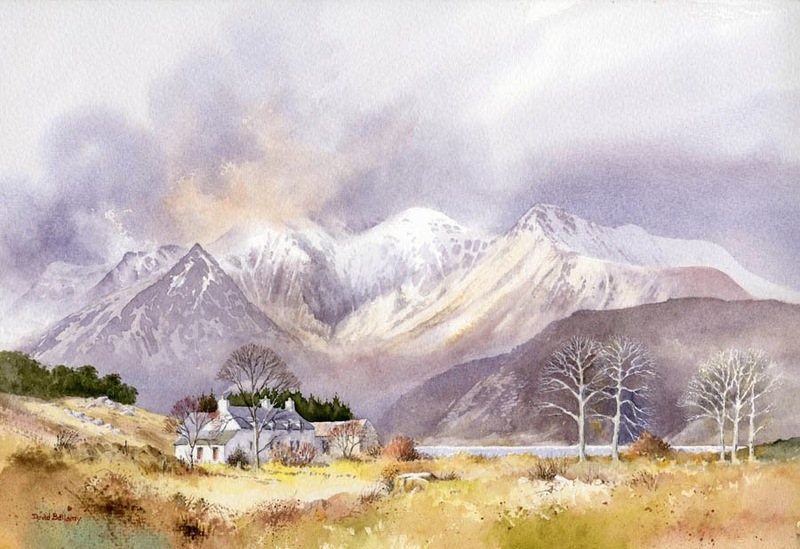 In this watercolour of the Applecross Mountains the contrast in colour temperature between the foreground and the background is striking. You can, of course beef up the warm colours well into winter if you don’t want your compositions to appear to cold overall. In this painting, which you will find on a larger scale in my book Winter Landscapes in Watercolour, the mountain details have been rendered in cool blues, apart from where the low sunlight is catching the higher parts. In the sunlit features I dropped in a touch of light red while the dark crags were still wet, and this also helps to place more emphasis on certain parts of the scene. During the change of seasons be ready for this effect and look out for it in your local landscapes. Be prepared to move around to set those lively warm colours against the cool mountains and snow. It will really bring your work to life. There are still places left on my seminar in Pontypool on Saturday 1st November, on painting winter landscapes in watercolour, and it includes a full demonstration and an illustrated talk on creating exciting winter scenes, with a great many examples of different types of landscape. It is aimed at preparing you for painting the winter landscape both indoors and outdoors, and making the most of this fascinating season. Check it out on my website. In the meantime, enjoy your painting! We’ve just finished the studio filming with APV Films for my forthcoming DVD on painting Winter Landscapes, due out in September with my book of the same title. Most of the filming went smoothly, although the last part was heavily punctuated by wild gusts of wind and heavy rain lashing the studio, accompanied by a bombardment of artillery fire from the Sennybridge range. Thankfully they were not firing at us! It rather reminds me of the time I was sketching and camping on a Northumberland bombing range, having missed the signs somehow………. At the moment I’m working on Wild Highlands, an exhibition in conjunction with the John Muir Trust, which will run from 16th April to 18th June in Pitlochry, Scotland. One of the aims of the exhibition is to highlight the ongoing devastation of the Scottish Highlands by industrialisation by massed wind turbines and their supporting power lines, which are now encroaching on some of the stunning mountain landscapes that epitomise the Highlands. Many of these will be on peat blankets and former forestry areas, which are the closest equivalent we have in the UK to rain-forests. 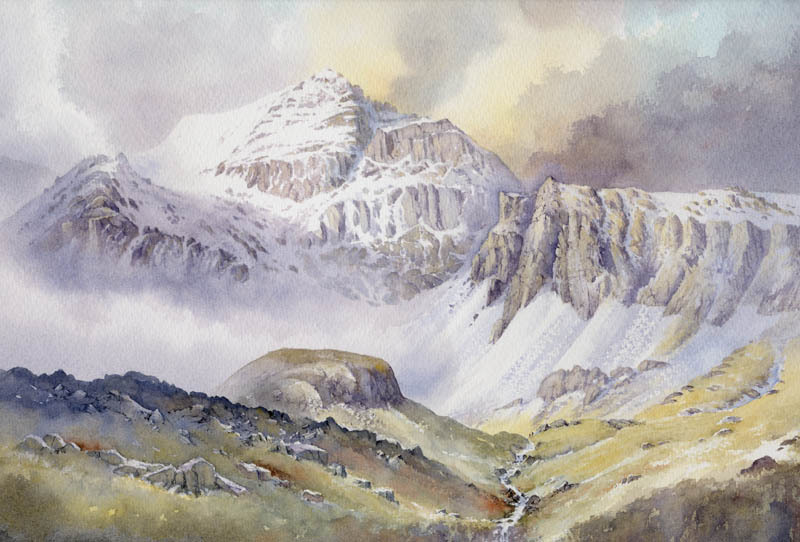 This painting of Beinn Eighe will be in the exhibition, and you can see that the mountain has several summits. Painting all these in good weather can invoke a feeling of having too many summits, so this is where it’s often a good idea to bring in some bad weather to hide one or two. It also adds a sense of mystery, which viewers love. I usually achieve this effect of mountains hidden in clouds by running the mountain washes up into a wet area in the sky – in this instance where you can see the pink effect. An alternative technique is to soften off the mountain peak with a wet sponge. I’ve not long returned from a trip to the Canadian Rockies, where the mountains rise high in truly awesome splendour. I managed around a hundred sketches, many in watercolour, and the hot, sunny weather made it really a pleasure to be out sketching. Luckily I had some bad-weather days as well, even some snowfall, and this gave my work that added atmosphere: when you can see everything there is no mystery. 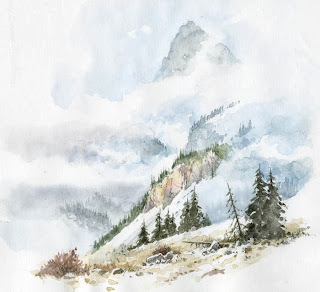 This watercolour of Stoney Squaw Mountain near Banff was done on a cartridge sketchbook, showing fresh snow and wreaths of mist, which many find difficult to tackle. If you use copious amounts of water and keep your edges soft (sometimes you need to soften edges that have dried hard with a damp brush). 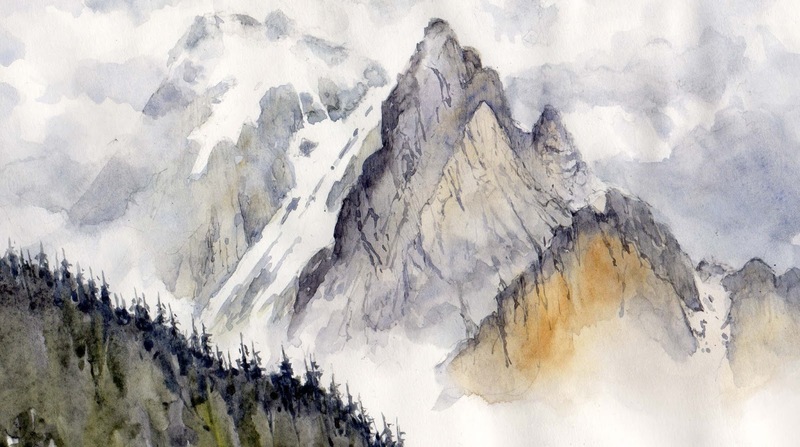 Obviously experience with the wet-into-wet technique helps here, and you may well need to re-wet some areas to create misty shapes of crags, trees and ridges. One of the great advantages of the colour sketch over a photograph in a situation like this is that you usually find the camera will record simply stark contrasts of dark rock and white snow, losing any sense of colour, unless strong light is highlighting any colour. When sketching, observe carefully any colour present in rocks and vegetation, even exaggerating it if necessary, to avoid the work looking too cold or sombre. I can’t wait to get going on some enormous compositions of the Canadian scenes.